The image below shows early oral squamous cell carcinoma (OSCC) on the lateral border of the tongue. Different clinical presentations of oral squamous cell carcinoma (OSCC) on the anterior and posterior lateral border of the tongue illustrate the importance of differential diagnosis. This first case was thought to be an allergic reaction to amalgam. Therefore, the importance of a good differential diagnosis. Mouth (oral) cancer is a major neoplasm worldwide and accounts for most head and neck cancers. It theoretically should be largely preventable or detectable at an early stage. Approximately 90% of oral cancers are SCC, which is seen typically on the lateral border of the tongue, oropharynx, and floor of the mouth, as a red lesion (erythroplakia), white lesion (leukoplakia), or a mix of the two (erythroleukoplakia) with an ulcer. See the image below. Oral squamous cell carcinoma in the most common intraoral site manifesting as a chronic, indurated ulcer. OSCC is particularly common in the developing world, mostly in older males. There is concern about an ongoing increase in younger patients and in women in particular, as well as in the oropharynx, possible due to human papillomavirus (HPV) infection. The etiology of OSCC appears to be multifactorial and strongly related to lifestyle, mostly habits and diet (particularly tobacco alone or in combination with betel, and alcohol use). Other factors such as infective agents may also be implicated, particularly in oropharyngeal cancer (HPV). Immune defects or immunosuppression, defects of carcinogen metabolism, or defects in DNA-repair enzymes underlie some cases of SCC. Sunlight exposure predisposes to lip cancer. Findings from the history and clinical examination by a trained dentist are the primary indicators of OSCC, but the diagnosis must always be confirmed histologically with tissue biopsies, even if the clinical picture is consistent with OSCC. In oral squamous cell carcinoma (OSCC), modern DNA technology, especially allelic imbalance (loss of heterozygosity) studies, have identified chromosomal changes suggestive of the involvement of tumor suppressor genes (TSGs), particularly in chromosomes 3, 9, 11, and 17. Functional TSGs seem to assist growth control, while their mutation can unbridle these control mechanisms. The regions most commonly identified thus far have included some on the short arm of chromosome 3, a TSG termed P16 on chromosome 9, and the TSG termed TP53 on chromosome 17, but multiple other genes are being discovered. As well as damage to TSGs, cancer may also involve damage to other genes involved in growth control, mainly those involved in cell signaling (oncogenes), especially some on chromosome 11 (PRAD1 in particular) and chromosome 17 (Harvey ras [H-ras]). Changes in these and other oncogenes can disrupt cell growth control, ultimately leading to the uncontrolled growth of cancer. H-ras was one of the oncogenes that first caught the attention of molecular biologists interested in cell signaling, cell growth control, and cancer. It and the gene for epidermal growth factor receptor (EGFR) are involved in cell signaling. The genetic aberrations involve, in order of decreasing frequency, chromosomes 9, 3, 17, 13, and 11 in particular, and probably other chromosomes, and involve inactivated TSGs, especially P16, and TP53 and overexpressed oncogenes, especially PRAD1. The molecular changes found in OSCC from Western countries (eg, United Kingdom, United States, Australia), particularly TP53 mutations, are infrequent in Eastern countries (eg, India, Southeast Asia), where the involvement of ras oncogenes is more common, suggesting genetic differences that might be involved in explaining the susceptibility of certain groups to OSCC. Carcinogen-metabolizing enzymes are implicated in some patients. Alcohol dehydrogenase oxidizes ethanol to acetaldehyde, which is cytotoxic and results in the production of free radicals and DNA hydroxylated bases; alcohol dehydrogenase type 3 genotypes appear predisposed to OSCC. Cytochrome P450 can activate many environmental procarcinogens. Ethanol is also metabolized to some extent by cytochrome P450 IIEI (CYP2E1) to acetaldehyde. Mutations in some TSGs may be related to cytochrome P450 genotypes and predispose to OSCC. Glutathione S transferase (GST) genotypes may have impaired activity; for example, the null genotype of GSTM1 has a decreased capacity to detoxify tobacco carcinogens. Some GSTM1 and GSTP1 polymorphic genotypes and GSTM1 and GSTT1 null genotypes have been shown to predispose to OSCC. N-acetyltransferases NAT1 and NAT2 acetylate procarcinogens. N-acetyl transferase NAT1*10 genotypes may be a genetic determinant of OSCC, at least in some populations. DNA repair genes are clearly involved in the pathogenesis of some rare cancers, such as those that occur in association with xeroderma pigmentosum, but, more recently, evidence of defective DNA repair has also been found to underlie some OSCCs. An immune deficiency state may predispose one to a higher risk of developing OSCC, especially lip cancer. Unfortunately, the parts of the world where oral cancer is most common are also those where descriptive information (ie, incidence, mortality, prevalence) is least available. In certain countries, such as Sri Lanka, India, Pakistan, and Bangladesh, oral cancer is the most common cancer. In parts of India, oral cancer can represent more than 50% of all cancers. Oral cancer affects males more frequently than females, although the ratio is equalizing. Oral cancer is predominantly found in middle-aged and older persons. However, in recent years, an increase in younger patients has been observed. In general, the prognosis for oral cancer depends on tumor staging and the location of the tumor. At most times, the staging of the tumor is associated with the timing of the diagnosis. The earlier the diagnosis, the lower the tumor stage, and hence, a better survival rate (83.7%) is noted compared with a lower survival rate with a late diagnosis, leading to a higher stage III-IV (38.5%). However, other factors also have to be taken into account, such as the location of the tumor, the patient’s general health, age, tobacco usage, and the presence of human papillomavirus (HPV) infection. Based on 2017 data from the United States, the estimated 5-year survival rate for oral and pharyngeal cancers is approximately 66%. Lip carcinomas generally has the best 5-year survival rate (88%) and the floor of mouth has the worst (54%). Tumor staging is the best prognostic factor for intraoral cancers and lip carcinomas, while the status of transcriptionally active HPV is considered the most important prognostic factor for oropharyngeal cancers. Those with HPV-positive tumors tend to respond better to chemotherapy and/or radiation therapy compared with those with HPV-negative tumors. Unfortunately, little has been done in regard to patient education as it concerns oral cancer. Like melanoma, oral cancer can be easily seen, except those in the posterior regions of the tongue, by the patient and the primary care physician. However, this is true only if they know how to identify it. Of interest, the National Cancer Institute (NCI) estimates 87,110 new cases of melanoma for 2017, with 9,730 estimated deaths, while for oral cancer, they estimate 49,670 new cases, with a mortality of 9,700. This difference can only be explained by the aggressive campaign sponsored by the America Academy of Dermatology (AAD) against melanoma, which produced and distributed visual teaching material for patients about the risk of melanoma and the typical clinical presentation. Increased awareness instituted by relevant dental societies to educate the public on the risks and typical clinical presentation of oral squamous cell carcinoma (OSCC) is recommended. Scully C. Rule for cancer diagnosis. Br Dent J. 2013 Sep. 215(6):265-6. [Medline]. Silverman S Jr. Early diagnosis of oral cancer. Cancer. 1988 Oct 15. 62 (8 Suppl):1796-9. [Medline]. National Cancer Institute. Cancer Stat Facts: Oral Cavity and Pharynx Cancer. National Cancer Institute, Surveillance, Epidemiology and End Result Program. Available at https://seer.cancer.gov/statfacts/html/oralcav.html. Accessed: May 20, 2017. Nagler R, Dayan D. The dual role of saliva in oral carcinogenesis. Oncology. 2006. 71(1-2):10-7. [Medline]. Tomar SL, Loree M, Logan H. Racial differences in oral and pharyngeal cancer treatment and survival in Florida. Cancer Causes Control. 2004 Aug. 15(6):601-9. [Medline]. Scully C, Bedi R. Ethnicity and oral cancer. Lancet Oncol. 2000 Sep. 1(1):37-42. [Medline]. Scully C. Challenges in predicting which oral mucosal potentially malignant disease will progress to neoplasia. Oral Dis. 2014 Jan. 20(1):1-5. [Medline]. Hashibe M, Mathew B, Kuruvilla B, Thomas G, Sankaranarayanan R, Parkin DM, et al. Chewing tobacco, alcohol, and the risk of erythroplakia. Cancer Epidemiol Biomarkers Prev. 2000 Jul. 9 (7):639-45. [Medline]. Lumerman H, Freedman P, Kerpel S. Oral epithelial dysplasia and the development of invasive squamous cell carcinoma. Oral Surg Oral Med Oral Pathol Oral Radiol Endod. 1995 Mar. 79 (3):321-9. [Medline]. Silverman S Jr, Gorsky M, Lozada F. Oral leukoplakia and malignant transformation. A follow-up study of 257 patients. Cancer. 1984 Feb 1. 53 (3):563-8. [Medline]. Walsh T, Liu JL, Brocklehurst P, Glenny AM, Lingen M, Kerr AR, et al. Clinical assessment to screen for the detection of oral cavity cancer and potentially malignant disorders in apparently healthy adults. Cochrane Database Syst Rev. 2013 Nov 21. 11:CD010173. [Medline]. Campisi G, Panzarella V, Giuliani M, Lajolo C, Di Fede O, Falaschini S, et al. Human papillomavirus: its identity and controversial role in oral oncogenesis, premalignant and malignant lesions (review). Int J Oncol. 2007 Apr. 30(4):813-23. [Medline]. Petti S, Scully C. Oral cancer: the association between nation-based alcohol-drinking profiles and oral cancer mortality. Oral Oncol. 2005 Sep. 41(8):828-34. [Medline]. Su CC, Yang HF, Huang SJ, Lian IeB. Distinctive features of oral cancer in Changhua County: high incidence, buccal mucosa preponderance, and a close relation to betel quid chewing habit. J Formos Med Assoc. 2007 Mar. 106(3):225-33. [Medline]. Rodu B, Jansson C. Smokeless tobacco and oral cancer: a review of the risks and determinants. Crit Rev Oral Biol Med. 2004. 15(5):252-63. [Medline]. Warnakulasuriya S. Smokeless tobacco and oral cancer. Oral Dis. 2004 Jan. 10(1):1-4. [Medline]. Chainani-Wu N, Epstein J, Touger-Decker R. Diet and prevention of oral cancer: strategies for clinical practice. J Am Dent Assoc. 2011 Feb. 142 (2):166-9. [Medline]. [Full Text]. Rosenquist K, Wennerberg J, Schildt EB, Bladström A, Göran Hansson B, Andersson G. Oral status, oral infections and some lifestyle factors as risk factors for oral and oropharyngeal squamous cell carcinoma. A population-based case-control study in southern Sweden. Acta Otolaryngol. 2005 Dec. 125(12):1327-36. [Medline]. Scully C. Oral squamous cell carcinoma; from an hypothesis about a virus, to concern about possible sexual transmission. Oral Oncol. 2002 Apr. 38(3):227-34. [Medline]. Mallery SR, Stoner GD, Larsen PE, Fields HW, Rodrigo KA, Schwartz SJ, et al. Formulation and in-vitro and in-vivo evaluation of a mucoadhesive gel containing freeze dried black raspberries: implications for oral cancer chemoprevention. Pharm Res. 2007 Apr. 24(4):728-37. [Medline]. Boyle P, Maisoneuve P, Andreoni B, et al. Prevention of upper gastrointestinal tract cancer. Recent Advances in the Treatment and Biology of Solid Tumours. Oxford, England: Medicine Foundation; 1997. 27-33. Silverman S Jr, Migliorati C, Barbosa J. Toluidine blue staining in the detection of oral precancerous and malignant lesions. Oral Surg Oral Med Oral Pathol. 1984 Apr. 57 (4):379-82. [Medline]. Vanderveken OM, Szturz P, Specenier P, Merlano MC, Benasso M, Van Gestel D, et al. Gemcitabine-Based Chemoradiation in the Treatment of Locally Advanced Head and Neck Cancer: Systematic Review of Literature and Meta-Analysis. Oncologist. 2016 Jan. 21 (1):59-71. [Medline]. Macha MA, Matta A, Kaur J, et al. Prognostic significance of nuclear pSTAT3 in oral cancer. Head Neck. 2011 Apr. 33(4):482-9. [Medline]. Silverman JE, Weber CW, Silverman S Jr, Coulthard SL, Manning MR. Zinc supplementation and taste in head and neck cancer patients undergoing radiation therapy. J Oral Med. 1983 Jan-Mar. 38 (1):14-6. [Medline]. Morrish RB Jr, Chan E, Silverman S Jr, Meyer J, Fu KK, Greenspan D. Osteonecrosis in patients irradiated for head and neck carcinoma. Cancer. 1981 Apr 15. 47 (8):1980-3. [Medline]. Epstein J, van der Meij E, McKenzie M, Wong F, Stevenson-Moore P. Hyperbaric oxygen therapy. Oral Surg Oral Med Oral Pathol Oral Radiol Endod. 1996 Mar. 81 (3):265-6. [Medline]. [Full Text]. Alorabi M, Shonka NA, Ganti AK. EGFR monoclonal antibodies in locally advanced head and neck squamous cell carcinoma: What is their current role?. Crit Rev Oncol Hematol. 2015 Dec 19. [Medline]. Soulières D, Aguilar JL, Chen E, Misiukiewicz K, Ernst S, Lee HJ, et al. Cetuximab plus platinum-based chemotherapy in head and neck squamous cell carcinoma: a randomized, double-blind safety study comparing cetuximab produced from two manufacturing processes using the EXTREME study regimen. BMC Cancer. 2016 Jan 14. 16 (1):19. [Medline]. Khan Z, Epstein JB, Marur S, Gillespie MB, Feldman L, Tsai HL, et al. Cetuximab activity in dysplastic lesions of the upper aerodigestive tract. Oral Oncol. 2016 Feb. 53:60-6. [Medline]. Devaiah A, Murchison C. Analysis of 473 US Head and Neck Cancer Trials (1996-2014): Trends, Gaps, and Opportunities. Otolaryngol Head Neck Surg. 2016 Feb. 154 (2):309-14. [Medline]. Robert F, Ezekiel MP, Spencer SA, et al. Phase I study of anti--epidermal growth factor receptor antibody cetuximab in combination with radiation therapy in patients with advanced head and neck cancer. J Clin Oncol. 2001 Jul 1. 19(13):3234-43. [Medline]. Kies MS, Arquette M, Nabell L, et al. Final report of the efficacy and safety of the anti-epidermal growth factor antibody, cetuximab (IMC-C225), in combination with cisplatin in patients with recurrent squamous cell carcinoma of the head and neck (SSCHN) refractory to cisplatin. Proc Am Soc Clin Oncol. 2002. 21:232a. Herbst RS, Arquette M, Shin DM, et al. Phase II multicenter study of the epidermal growth factor receptor antibody cetuximab and cisplatin for recurrent and refractory squamous cell carcinoma of the head and neck. J Clin Oncol. 2005 Aug 20. 23(24):5578-87. [Medline]. Baselga J, Trigo JM, Bourhis J, et al. Phase II multicenter study of the antiepidermal growth factor receptor monoclonal antibody cetuximab in combination with platinum-based chemotherapy in patients with platinum-refractory metastatic and/or recurrent squamous cell carcinoma of the head and neck. J Clin Oncol. 2005 Aug 20. 23(24):5568-77. [Medline]. Vermorken JB, Mesia R, Vega-Villegas ME, et al. Cetuximab in combination with cisplatin or carboplatin and 5-fluorouracil (5-FU) in the first-line treatment of patients with recurrent and/or metastatic squamous cell carcinoma of the head and neck. Am Soc Clin Onco lProc. 2006. Abstract 5537:24:289s. Kies MS, Garden AS, Holsinger C, et al. Induction chemotherapy with weekly paclitaxel, carboplatin, and cetuximab for squamous cell carcinoma of the head and neck. Proc Am Soc Clin Oncol. 2006. Abstract 5520.:24:285s. Hamakawa H, Nakashiro K, Sumida T, et al. Basic evidence of molecular targeted therapy for oral cancer and salivary gland cancer. Head Neck. 2008 Jun. 30(6):800-9. [Medline]. Watters AL, Epstein JB, Agulnik M. Oral complications of targeted cancer therapies: a narrative literature review. Oral Oncol. 2011 Jun. 47(6):441-8. [Medline]. Chinn SB, Myers JN. Oral Cavity Carcinoma: Current Management, Controversies, and Future Directions. J Clin Oncol. 2015 Oct 10. 33 (29):3269-76. [Medline]. Machiels JP, Schmitz S. Epidermal Growth Factor Receptor Inhibition in Squamous Cell Carcinoma of the Head and Neck. Hematol Oncol Clin North Am. 2015 Dec. 29 (6):1011-32. [Medline]. Vladimirova LY, Agieva AA, Engibaryan MA. [Anti-EGFR monoclonal antibodies in locally advanced head and neck squamous cell cancer]. Vopr Onkol. 2015. 61 (4):580-2. [Medline]. Cancer developing on the gingiva. Cervical lymph node metastasis from oral cancer. This photo illustrates the importance of a thorough oral exam. Early oral squamous cell carcinoma (OSCC) on lateral border of tongue. Notice the ulcer, tender at time of diagnosis, but not indurated, which was missed by referral doctor. 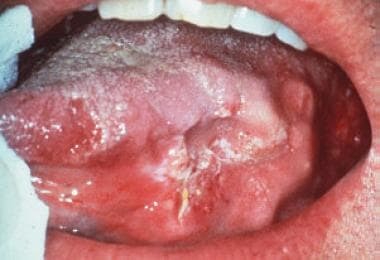 Oral squamous cell carcinoma (OSCC) presenting as a large, ulcerated lump on the left anterior lateral border of the tongue.